Put the thermostat on the head where it belongs. More responsive - Faster engine warm up. Retain heat in engine for more power. The cast iron water outlet no longer requires a molded bent hose. 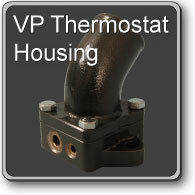 A standard Model A hose now works as is with the VP Model A Thermostat Housing! Just like your body needs to warm up and get loose before an exercise, so to should your car’s engine before you take off on a long ride. Getting your engine to a stable operating temperature quickly and keeping it there extends engine life and improves engine performance, plus it’s environmentally friendly. 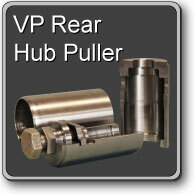 VP Model A Thermostat Housing Kits have been tested over the last SIX YEARS in touring Model A’s. From California traveling to and from Nevada through the Sierra Nevada Mountains as well as to Canada and back through the Siskiyou Mountains in the hot summer months, they have been proven to help control engine temperature and even control coolant loss. The benefits of thermostats are well known, but in the past, common practice for use in Model A’s has been to locate the thermostat in the hose between the engine and the radiator. Using a thermostat in this location gives a poorer response to temperature change and can lead to overheating. Overheating can also happen due to thermostats failing, sticking either open or closed. If your thermostat fails or malfunctions, it may cause engine damage or failure. The VP Model A Thermostat Housing provides the correct location for the thermostat and also provides a perfect location to install a temperature gauge, the best and simplest way to monitor the performance of your engine. We highly recommend using a temperature gauge. It is the only accurate way to monitor your cooling system performance. Typically, electric temperature gauges use 1/4" NPT senders and mechanical gauges use 1/2" NPT senders. 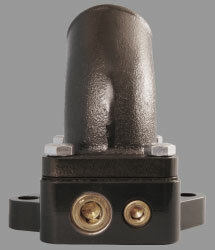 The Vintage Precision Thermostat Housing has (1) 1/2" NPT port and (1) 1/4" NPT port. 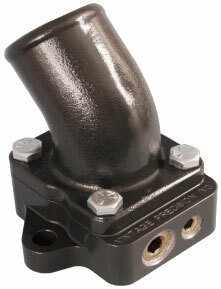 The VP Model A Thermostat Housing replaces the standard “gooseneck” water outlet. Re-use your standard hose and clamps, the kit fits both 28’/29’ and 30’/31’ applications. It’s easy to install and even easier to service. It comes with a Stant Superstant 160 degree thermostat (Part #45356), painted and ready to install. The Stant Superstant 180 degree thermostat (Part #45358) will also work, but is not supplied. With the VP Thermostat Housing Kit and an added temperature gauge installed, you can tour with confidence and keep an eye on performance. Although this system will not correct a faulty cooling system, it will definitely help you resolve cooling issues by controlling water flow and monitoring temperature. Many books and articles talk about fixing cooling problems and this becomes a tool to help in that process. Maintaining engine temperature and keeping the heat in the engine improves thermal efficiency, giving you more power. Engine oil stays cleaner, you get better fuel economy and improved air quality. 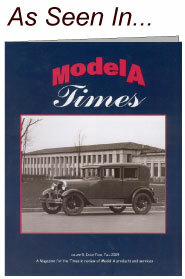 After the last Model A was built, Ford decided thermostats should be added for all the reasons discussed. Now you can improve your Model A’s performance, economy and durability by installing a VP Model A Thermostat Housing Kit. For more information on the VP Model A Thermostat Housing including updated pricing and availability, or if you don't see what you're looking for, let us know. Contact us now by clicking here, or call our customer service department at 1-800-486-0021.